Learn microblading for over-plucked or over-waxed brows online! Microblading for over-plucked/over-waxed brows is now available as an online course! Learn the best techniques from the experts at Eye Design. All of our online courses are led by founder and Master Technician Nadia Afanaseva in English, Spanish and Russian. For beginner technicians, microblading on clients with over-plucked, over-waxed or otherwise extremely sparse brows can be especially tricky. It takes proper training and a lot of practice. Microblading artists must master specific techniques (such as Eye Design’s 5-point drawing method, hair stroke patterns and more) in order to create beautiful results for these particularly difficult cases. Working with extra care is essential when restoring over-plucked, over-waxed and naturally sparse brows. Because clients with over-plucked brows do not have a lot of natural hairs to help the microbladed hair strokes blend in, technicians must be as precise as possible. Every hair stroke must be applied in the correct position. If strokes are too close or too far apart, results will look extremely unnatural, and this is especially apparent on clients who have little-to-no hair of their own. Eye Design founder and Master Technician Nadia Afanaseva developed flawless hair-stroke application patterns that can be adjusted slightly to suit each client as an individual. During our online classes (and at our live classes), you yourself will learn how to use these patterns and adjust them according to different face/brow shapes. We also go in-depth on the theories behind our techniques so that you achieve a higher level of understanding. You get all the information straight from the developer herself! Practicing (first on paper, and then on artificial skin) helps you to perfect your drawing skills. Eye Design’s highly skilled working technicians are available to assess your drawings and provide helpful feedback. Before you start hair-stroke placement patterns, however, you must learn our studio’s 5-point drawing method. Whether the client is here for microblading, Powder Effect, Hybrid (microblading + Powder) or Shaping, our technicians always begin each eyebrow appointment with this innovative process. Using a Golden Mean caliper, Eye Design’s team can find the ideal brow shape for every client. Our technique, when paired with this tool, ensures each guest leaves us with brows that work in perfect harmony with the rest of his or her facial features! The Golden Mean, a mathematical ratio, has been around for centuries, so a simple Google search will provide you with a lot of info. 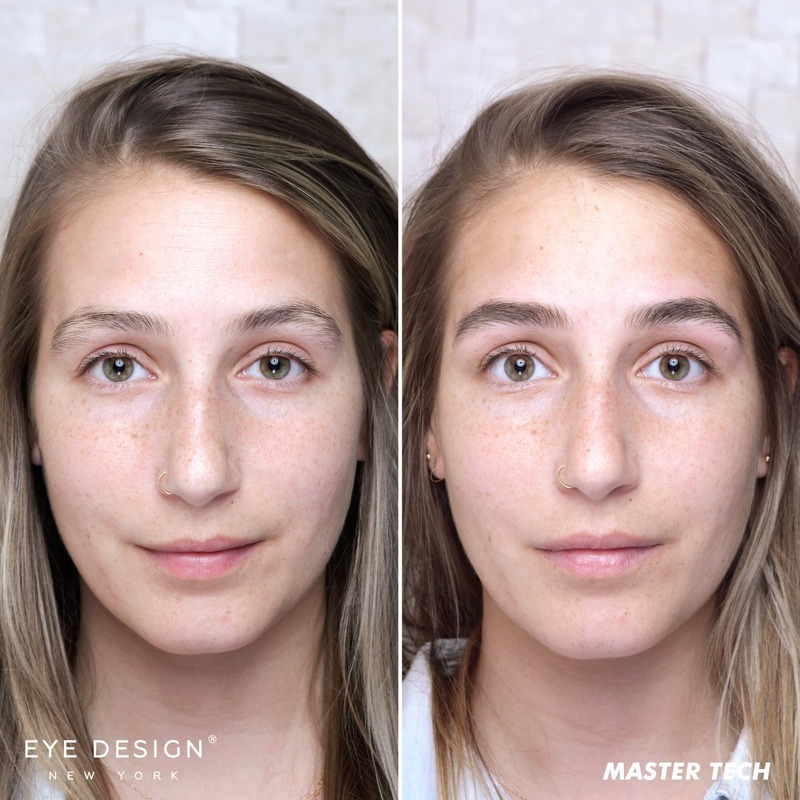 We have also broken it down for beauty professionals here on our blog, but in order to learn how to use this technique effectively on over-plucked brows, lessons from a Master are necessary. Our University welcomes experienced technicians to take this course at any time! It is available now in three languages: English, Spanish and Russian. All of Eye Design’s online students receive care and guidance from our staff. Click here to register online. Registration for any of our online courses grants you unlimited lifetime access to the course, so you can come back to refresh your skills whenever necessary. Be sure to follow Eye Design New York on Instagram for updates. We are working hard on new classes and more updates will be ready soon!